A common problem among people is “saddle slides back on my horse.” Many times this is with competition ropers and/or ranch cowboys who rope quite a bit in the pasture. Almost every single time I see this issue, it is more of human error than saddle fitting issues. When I am checking on this problem for someone, I have them saddle the horse just as they would any other time. This is when I know if we actually have a serious issue or just a simple human error. Usually, the customer will put the saddle way up on the withers right on top of the shoulder blades. At this point I run my hand under the saddle and pads and find the tip of the shoulder blade which is usually right under the center of the front bar pad. THIS IS NOT THE RIGHT SPOT FOR THE SADDLE TO SET. Now I don’t care how old you are or how long you have been a cowboy. I don’t even care if your dad, old grampy, your uncle, or John Wayne told you to set the saddle up high on the withers, I am telling you now, THIS IS NOT THE RIGHT SPOT FOR THE SADDLE TO SET. You should be able to find the tip of your horses scapula with ease every time you saddle him/her. This is crucial to his being able to compete at his best without you or your saddle getting in the way. As you can see on this horse, his scapula is angled back towards the end of his withers. When this horse takes a step forward with that leg, the scapula will move down a bit and reach towards the hip as much a two inches. This is where the flare in the front of the bars come in, this allows for clearance of the scapula under the front tip of the bar. With this scapula moving so much as the horse is walking, trotting, running, cutting, or even jumping it is very critical that we not restrict its movement with our saddle. A horse carries 60% of his weight on his front end and these massive shoulders are what allow him to collect that weight and move with the athleticism that makes them great. The shoulders are key to functioning well and painfree. If you set the saddle too far forward you are constricting the scapula’s movement and causing pain which leads to poor performance in the field. The least that happens is the horse’s scapula moves your saddle back off the blades, causing the saddle to slide back where it should have been to start with, creating a nonexistent problem. It could be worse depending on the jerk that the saddle takes and the placement the scapula is in at the time of the jerk in relation to the bar. If you have a problem with your saddle sliding back on your horse, try this and see if it helps before you assume the saddle is not fitting. When you saddle your horse, feel for the tip of the scapula under the saddle and pads. When you find this, shake your saddle back till the front concho is behind this point. I use the front conch as a good reference point for the front tip of the bar. If you have been riding your saddle too far forward for some time, this can feel weird when you get on and ride. You may feel like your too far back on your horse’s back. Don’t freak out! Give this an honest try and you will notice a big difference in how your horse performs and your saddle will not slide back anymore. Many people put their saddle on their horse’s back looking at where the girth is. Different rigging positions can change where the girth is in the girth area of your horse (we will address rigging positions in a later post). No matter the rigging position that you have, be it full or center fire, your saddle can only set where your saddle has to set… BEHIND THE SHOULDER BLADES. This is what makes saddle fitting difficult sometimes. A real short backed horse can make a person ride the saddle too far forward trying to get the back of the saddle away from the hip… still has to ride behind the shoulder blades. A big long shouldered horse will cause the rider to set the saddle too far forward because they feel like they are setting way back on their horse and the horse’s neck feels a mile long… still has to ride behind the shoulder blades. There are many, many, many other references on the internet that also explain this idea and also in more depth. Rod Nikkel has a great article that gives a more in-depth explanation. This is not a new idea or something that we claim as our way of fitting and saddle placement. This is a common problem, probably one of the most common, among riders of all levels. Always remember, in 1900 we rode horses a lot more than we do now and for longer periods of time, and in 2012 we have way more of a saddle fitting problem than we ever did then. Stay away from gimmicks (both saddles and pads) and be sure that the human variable isn’t what is causing your problem. 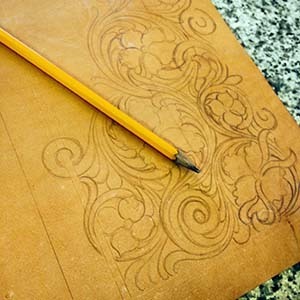 Are you interested in learning the leathercrafting trade? If you are and want to receive information about tutorials, videos, classes and products, then please subscribe to my newsletter. Success! One more step if you don't mind... please check your email to confirm your subscription.